Why Russia absolutely MUST host the 2018 World Cup. I wrote the following blog a year ago but in light of events in France and the growing clamour to strip Russia of 2018, I thought it worth posting again. Because in my opinion, nothing has changed. Not surprisingly, in the wake of the furore surrounding FIFA, calls have been made to strip both Russia and Qatar of their respective world cups. Whilst I totally agree with the logic in respect of Qatar, the idea of relocating 2018 even to England, fills me with horror. Yes, Blatter may be as bent as a nine bob note and yes, allegations that the bid was corrupt may well have a basis in fact, but to me the decision to stage the tournament in the motherland was always absolutely the correct one for one very simple reason. One of the great strengths of the global game has always been the fight against discrimination in all its forms and by taking the World Cup to Russia, it underlines that message by providing an opportunity to not only bring about, but actually witness real change. That’s why we have to continue along that path because to do otherwise would be a massive mistake. Now I know that will cause some angst in certain circles however, unlike the majority who will pontificate about this, I have actually been to Russia. Three times in fact. Just as importantly, I’ve spent considerable amounts of time in the company of Russian football fans including those who are, shall we say, questionable. As a consequence, I have more than a passing knowledge of what makes these guys tick and that knowledge is based not on the ill-informed drivel that the British tabloids are prone to pumping out, but on actual experience. And one of the things I learned quite quickly is that Russian football culture is very different from what we are used to here. That’s not to excuse the problems which infect the game there, many of which can legitimately be described as both racism and homophobia. But it is fair to say that racism in Russia is a very different animal from the beast we have here in the west and to treat the two in the same manner is a grave error. More importantly, if the game in the motherland is ever to see an end to discrimination, the very last method of bringing it about would be via the use of any kind of blanket punishment because in my experience, nothing will cement public attitude faster than the western nations adopting a ‘holier-than-thou’ stance. Russia is many things, but fiercely patriotic stands head and shoulders above everything else. Therefore, it is imperative that the tournament go ahead as planned because it provides the perfect platform for organisations such as FARE and Kick Racism to work with the Russian authorities and start actively promoting an anti-racism and anti-homophobia agenda. Just as importantly, it will provide scope for that agenda to be taken to those who stand firmly at the very heart of the problem because the support of Russian footballs extremist support will be absolutely vital. That might sound like wishful thinking but in my experience, it is perfectly achievable as long as it is done in the correct manner. However, if that is to happen, work must begin sooner rather than later because it’s going to take time to build both mutual respect and trust. Thankfully, we currently have the opportunity to do all of this which is why to give it up would be a tragedy. Not just for Russian football or for the entire Russian nation, but for everyone else. Lest we forget, football drove the anti-racism message into English society from the dark days of the 1970’s and there is nothing to suggest that exactly the same thing won’t happen in Russia on the back of 2018. Is it really worth the risk of losing that chance? I’m delighted to tell you that my non-fiction book Rebellion is finally available as an ebook. 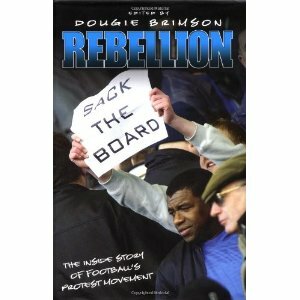 First published in 2006, it explores the background to some of the more infamous fan protests told by those who were right at the heart of things. Amongst the clubs featured are Charlton, Wimbledon, Manchester United, Manchester City, Norwich and Bournemouth amongst many others. I can also announce that my last novel, Wings of a Sparrow, may well be heading for TV as a four part comedy drama. Watch this space! All of my books and DVD’s are available from both Amazon and iTunes. Previous PostScreenwriting and the art of the opportunity.Next PostWhy ‘write what you know’ is the best advice you’ll ever hear. Absolutely spot on about keeping it in Russia – even if the vote was rigged, Russia is due a turn at holding the World Cup. Taking it away from Russia now is just going to make an already paranoid country pull the shutters up. If nothing else, the possibility of using the World Cup as a carrot to help begin a change in attitudes is something worth holding on to – with the added bonus that it might also be used to help reduce tensions in Ukraine as well. >> But it is fair to say that racism in Russia is a very different animal from the beast we have here in the west and to treat the two in the same manner is a grave error. great article! it’s good to know that there are people out there who aren’t brainwashed by BBC and CNN. You make a number of great points and in an ideal world, putting on the world cup in Russia will be a positive challenge to the football culture there – and the Russians may or may not embrace the changes you suggest. After recent events, and having spoken to someone who was in Marseille at the weekend, there is a big risk that fan visitors, particularly English, could be jumped by the Russian hooligans. To go ahead or move, is not an easy decision, and the potential for mayhem is huge. I don’t think it a simple West versus the Russkies scenario – but whether this would be a safe environment for football fans. However, the legal and political issues of moving the World Cup at such a short stage may be insurmountable and it will go ahead whatever.